Sagging Neckline: Neck Lift Surgery or Skin Tightening Treatment? Dr. Perkins: For Evolutions, I developed a protocol called Total Tightening that combines two of the top non-invasive skin tightening procedures, ReFirme and Titan, into one treatment. ReFirme uses Bi-Polar Radio Frequency and infrared light energies to heat the dermal tissue in the target area which reduces wrinkles and lifts sagging skin. Skin also becomes smoother and toned. Titan is a safe infrared light that heats the dermis which is well below the skin’s surface. The heat contracts existing collagen and stimulates new collagen to be produced. The epidermis -the top of the skin’s surface – is protected through a cooling device on the Titan handpiece. Each treatment will work to tighten existing collagen and promote new collagen growth. The result is a firmer, fresher look. Does Total Tightening work for the neck area? Dr. Perkins: Yes! ReFirme is safe and effective and can treat a number of areas including the face, abdomen, upper arms, knees, and neck. With Titan, we have seen exceptionally good results on the jawline, under the chin / neck area, and the abdomen. So using Total Tightening to firm up the neck area is definitely an option. How many Total Tightening treatments are needed? Dr. Perkins: We typically recommend four treatments and many clients see results after just one treatment. Results are cumulative so we urge people to continue with their series even if they are seeing results after the first session. Are the Total Tightening treatments painful and is there downtime after the treatment? Dr. Perkins: Most clients consider it comfortable and a topical numbing cream is usually not needed, but available for someone who is more sensitive. There may be some redness or swelling directly after the treatment that usually subsides within a few hours. Otherwise there is no downtime. Who is a good candidate for Total Tightening? Dr. Perkins: Total Tightening is good for those who have minimal looseness in the neck area. The new collagen that is stimulated from this treatment not only lends itself to tightening of the area, but will also create smoother skin. Clients are very happy with this result. Dr. Perkins: Incisions are made behind the ears and a small incision is made under the chin. Then I tie the muscles to create a sling effect to better support the neck area and a suspension suture may be used to give more long-lasting support. If necessary, excess skin will be removed. This is a surgical procedure so the patient will have a combination of local anesthesia, oral and intravenous sedation to provide relaxation and lack of awareness throughout the procedure. General anesthesia is not used. There is downtime for this procedure. People usually take 7 to 10 days off work for recuperation. Dr. Perkins: In general, a person who has moderate to severe skin laxity in the neck area is a good candidate for Neck Lift surgery. 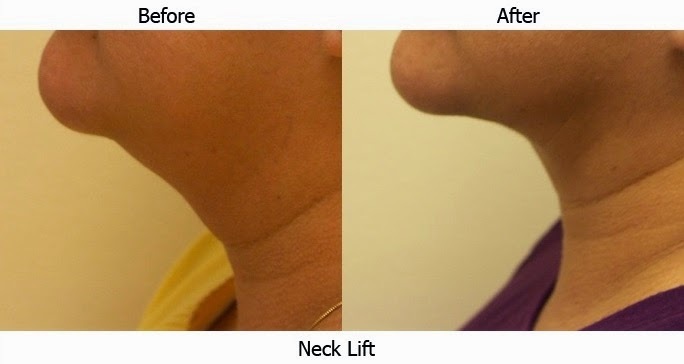 Neck Lift surgery can really redefine the lower half of a person’s face. 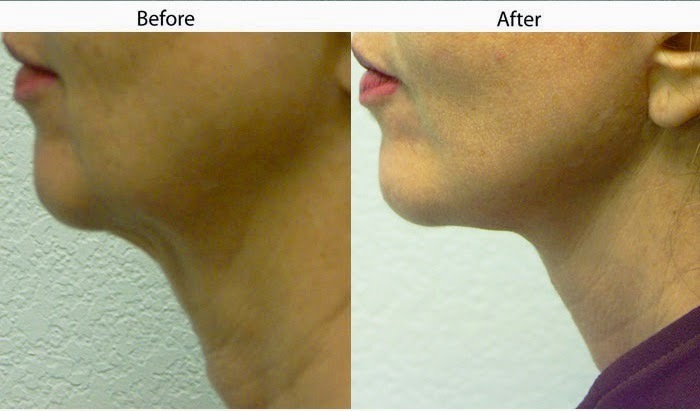 More definition in the neck and jawline can take years off a person’s appearance. Dr. Perkins: Whether you have neck lift surgery or a skin tightening or no treatment at all, I always remind people that they can help to stave off wrinkles and sagging skin by treating their neck area as they treat their face. The delicate skin needs to be cared for through proper cleansing, moisturizing, and, of course, daily application of an SPF broad spectrum sunscreen. If your saggy neckline is in need of help, contact Dr. Perkins. 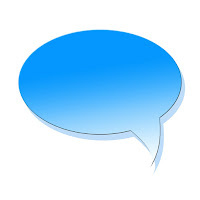 Call Cosmetic Surgery Center in Santa Barbara at 805-563-0000 for a consultation. 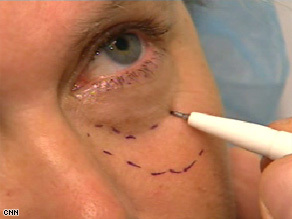 https://www.cosmeticsurgerysb.com/wp-content/uploads/2016/10/csc_logo_2-300x80.png 0 0 Dr. Perkins https://www.cosmeticsurgerysb.com/wp-content/uploads/2016/10/csc_logo_2-300x80.png Dr. Perkins2014-08-28 18:11:002014-08-28 18:11:00Sagging Neckline: Neck Lift Surgery or Skin Tightening Treatment? 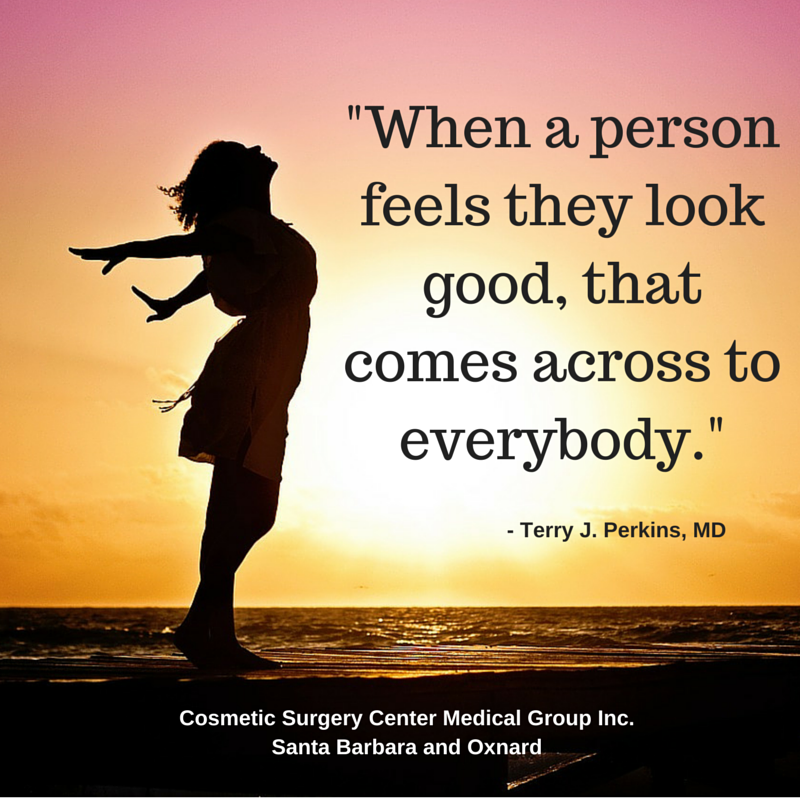 Santa Barbara cosmetic surgeon Dr. Terry Perkins is a facial rejuvenation specialist and will be the first to tell you that continuity in your appearance is the key to maintaing a youthful look. Many people pay close attention to their face – from using physician grade products to having facials and using Botox and fillers to combat signs of aging – but forget the neck area entirely. The neck is made up of delicate skin with fewer oil glands than the face so neglecting this area can cause accelerated aging. A taut, wrinkle-free face can quickly be undermined by a sagging and wrinkly neck and thus reveal your real age. For those who feel their neck could be in “better” shape, there are options to repair the muscle and skin laxity to make the neck what it once was. Necklift surgery by Dr. Perkins is usually done with incisions behind the ears and a small one under the chin. The muscles are usually tied to create a sling effect for better support and a suspension suture is often used to give more long-lasting support to the neck. The result is enhanced definition and a more toned appearance. Excess skin may be removed. If your neck is still in good “shape”, what can you do to keep it that way? Give your neck area the same treatment that you give to your face. When cleansing or using products such as moisturizer, serums, or SPF, don’t stop at the jawline. Feather the product down to the neck and chest area. Since the skin is thinner, antioxidant creams can help along with a daily dose of sunscreen. Proper care of the neck will help delay the signs of aging. 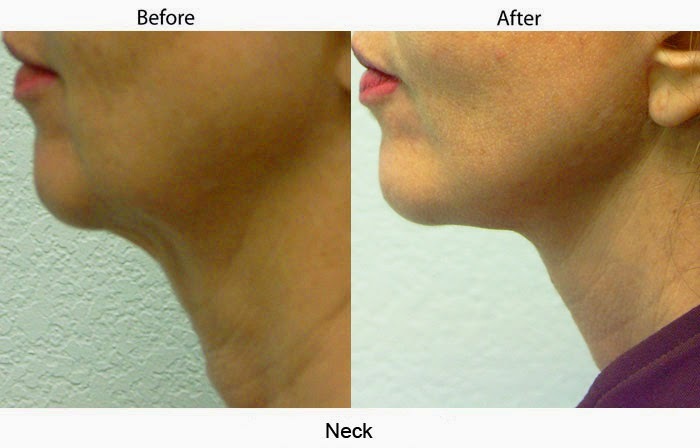 A necklift will restore a youthful appearance to your neck and to your whole appearance as well. Interested in a necklift or facial rejuvenation? 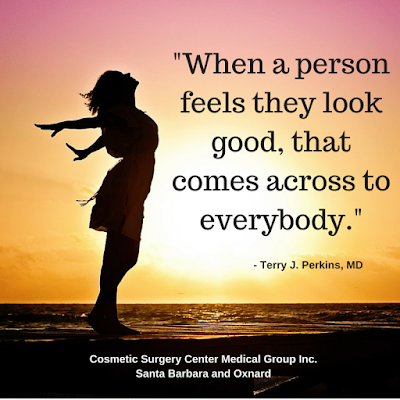 Contact Cosmetic Surgery Center in Santa Barbara at 805-563-0000 for a consultation with Dr. Terry Perkins. At Cosmetic Surgery Center of Santa Barbara, we use this blog for educational pieces on cosmetic surgery and as an advice column from Santa Barbara cosmetic surgeon Dr. Terry Perkins. Recently we made our list of favorite blog posts that have been read the most by our clients, friends, and family. For a consultation about facial surgery, upper body liposuction or tummy tucks with Santa Barbara cosmetic surgeon Dr. Terry Perkins, please call 805-563-0000.